The penguin & chick slide is available in 14k or 18k in an open edition . 36mm high. 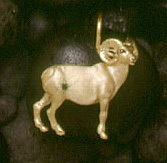 The 14 karat edition of this sheep is limited to 300, and the 18 karat is limited to 100. Both editions are 27mm high.